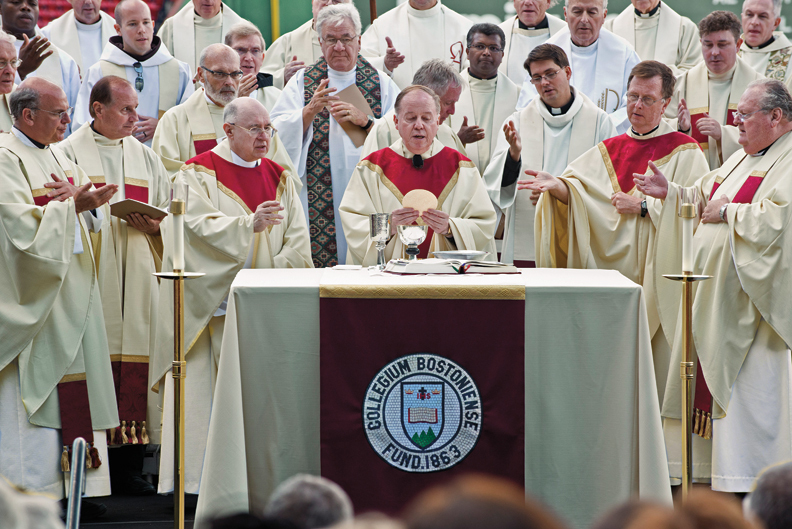 Click on image to view a slideshow of the Sesquicentennial Mass. Nearly 20,000 alumni, students, faculty, and friends of the University—in dress shirts and ties or late-summer skirts or Superfan Tees—filed into Fenway Park in the late afternoon of September 15 for the Sesquicentennial Mass, which commenced what will be an 18-month celebration of the chartering of Boston College in 1863. Before the service began, some in attendance genuflected and prayed. 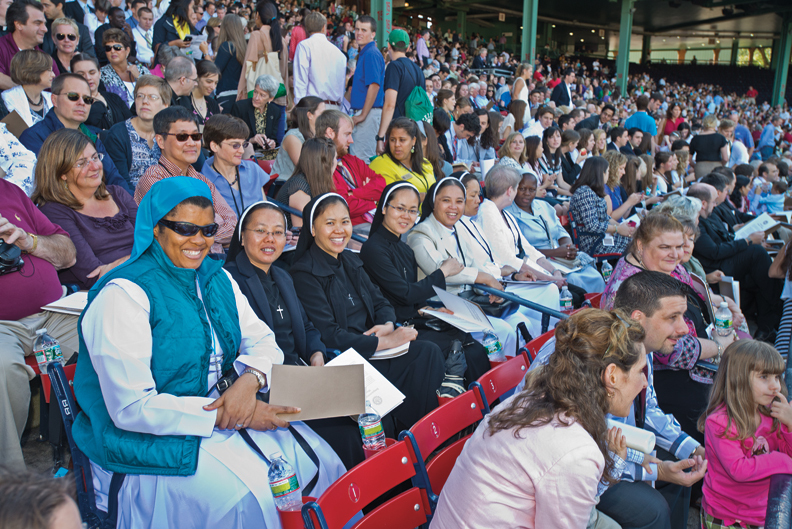 But most on this balmy sun-filled Saturday caught up with friends and snapped smartphone photos of the scene: the flower-fronted altar set up near home plate; the helicopters humming overhead. 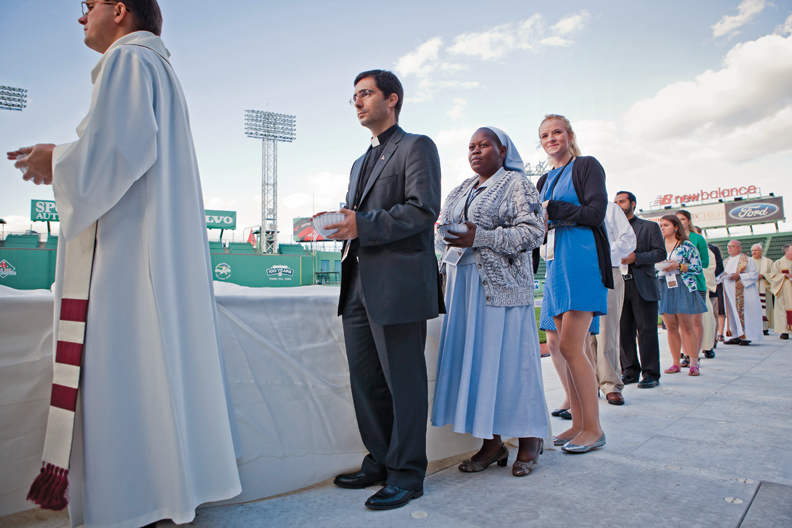 Then the Mass started, and a rarity: silence in Fenway. 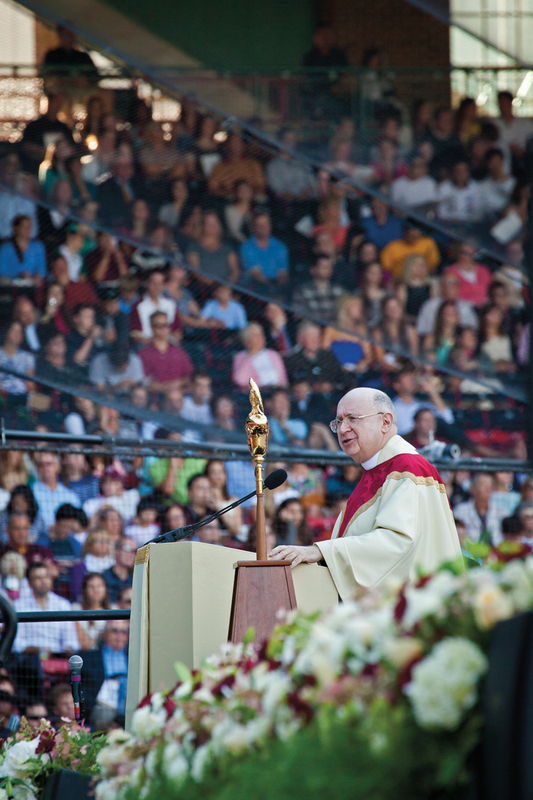 “We come here with a great spirit of gratitude because we in our own ways, in our institutions, and in our lives have been blessed,” University President William P. Leahy, SJ, the principal celebrant, began. “Let’s take a moment to place ourselves in the presence of the Lord.” Later, theology professor Rev. 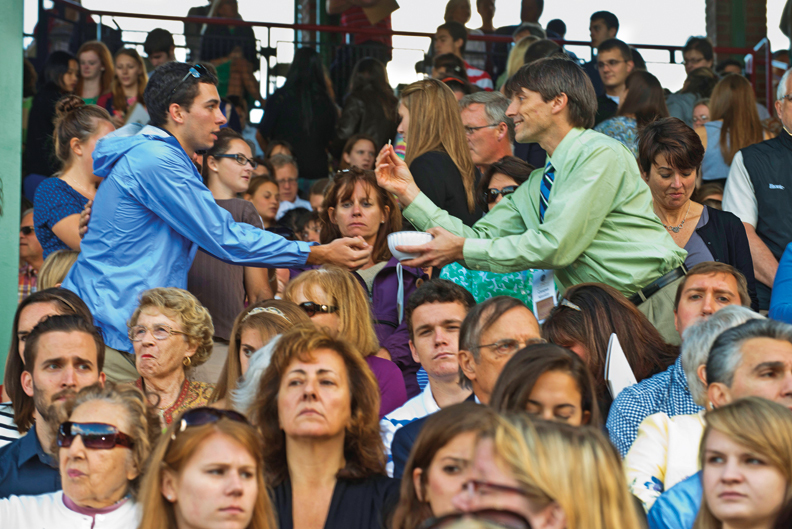 Michael Himes gave the homily, his amplified words echoing through the grandstands. 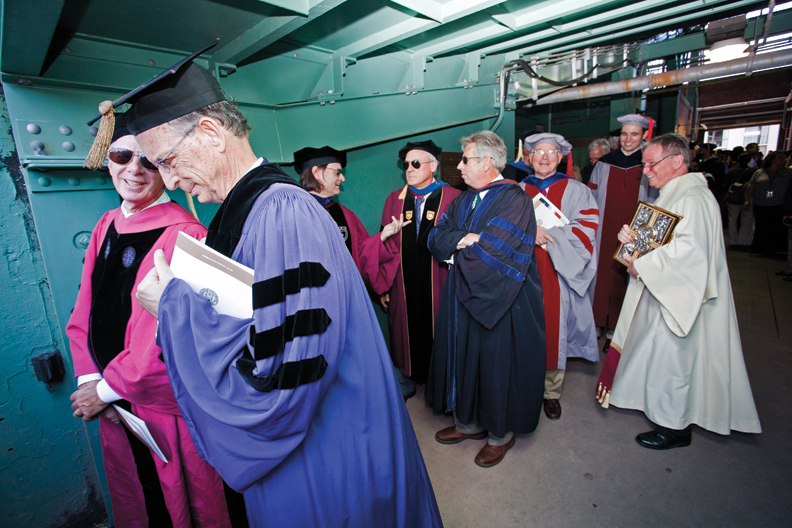 “You never fully grasp the fruits of your education until you give it away to another,” he said. 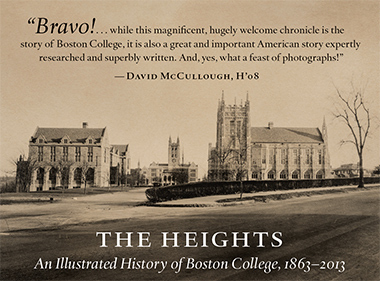 “The measure of the success of your education is the measure to which [lives of] people who never got to come to BC . 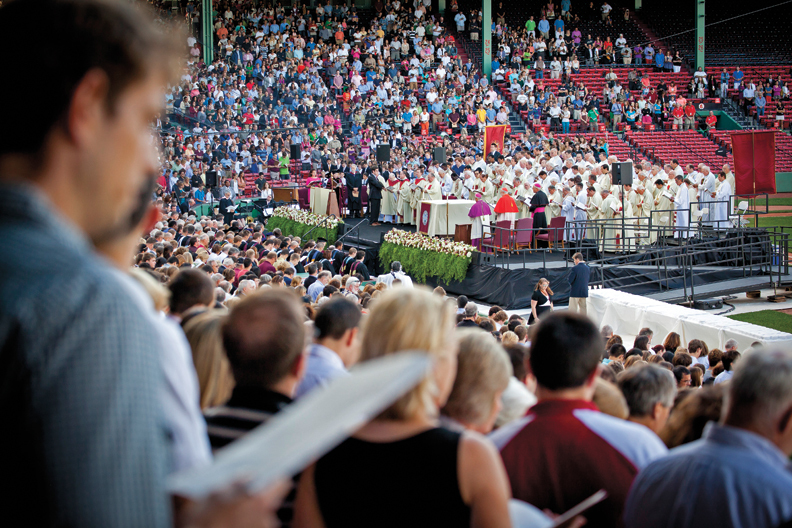 . . are richer, fuller, more genuinely human because you did.” A vigorous majority sang “We Walk by Faith,” led by the Liturgy Arts Group of Boston College, the University Chorale, and the liturgical choirs of Boston College High School and the School of Theology and Ministry. In remarks delivered at the end of Mass, Cardinal Sean O’Malley, OFM Cap, lauded the perseverance of Boston College founder, John McElroy, SJ, and fellow Jesuits in helping to “change the face of Boston in a Catholic emancipation.” “We still need the giants of Catholic education,” he said, and he pointed to the involvement of Boston College in the renewal of the city’s parochial schools.